Everyone has the right to live without the fear of violence and abuse. Deaf women are more at risk of domestic abuse than hearing women. It can be very difficult to find the right help and support if you use sign language as your method of communication. 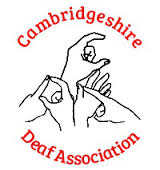 Cambridgeshire Deaf Association have teamed up with Women’s Aid to deliver The Freedom Programme in British Sign Language for Deaf women. The Freedom Programme supports women to recognise they are not to blame and understand why this is happening to them. We will provide child care during the sessions.